Once you’ve saved the API configuration settings the page will reload and you’ll see two new tabs available: General Settings and Contact Fields. One of the most common uses for WP Fusion is to add all new user registrations to your CRM. To enable this feature, click the checkbox next to Create Users. You can optionally limit contact creation to certain user roles. The default user role is “Subscriber”, for new non-administrator users, or you can leave this field blank to add all new users to your CRM. The next option, Assign Tags, lets you specify one or more tags to be added to new users after their contact record has been created. If you haven’t already, create a tag in your CRM, something like “New User”, or “New Website Registration”, to handle your new user registrations. If you’re creating a new tag after you’ve configured WP Fusion for the first time, the tag may not appear in the Assign Tags dropdown right away. Begin typing the tag name and if it doesn’t appear, click the “resynchronize” link in the dropdown to load any newly created tags. Create an automation in your CRM which is triggered by this tag being applied. Create a welcome email as the next item in your campaign sequence, to welcome your new user to your website. Note: If you’re running WooCommerce, it will assign users a role of “Customer” on checkout. If you want to add these users to your CRM, make sure you select the “Customer” role in addition to any others. 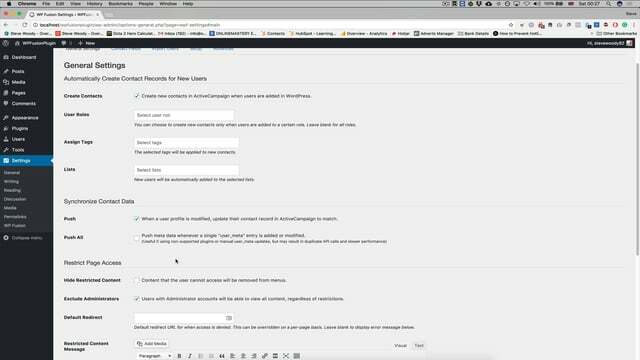 This video explores WP Fusion's "General" settings tab, and covers the various options for handling user registrations, tagging new contacts, and assigning them to lists. 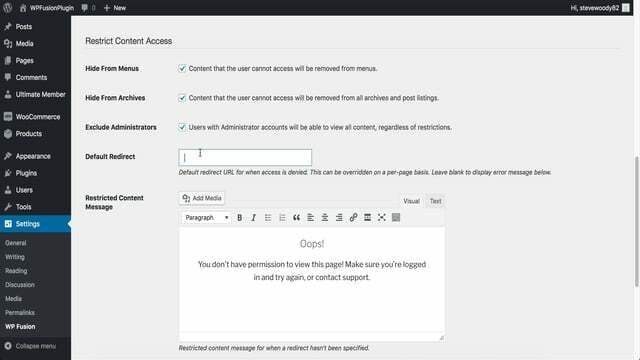 This video covers the various settings for content restriction on the "General" tab of the WP Fusion settings.